It started about two months ago. Suddenly there were dead or half-dead hornets right in front of the entrance door of our stairhall. Not just one at a time, but two or three. And they didn’t stay in front of the door downstairs. They entered the stairhall and they went upstairs. With temperatures over 30° celsius and the resulting lack of socks and shoes on our feet (the little one indulged completely in the barefoot-season, and so did I, mainly because I didn’t fit into my shoes anyway), it became quite challenging to make our way outside without stepping onto a dying hornet. And I don’t think that the fact that hornets are, apparently, not more dangerous than bees and wasps makes it less comfortable to step on them. After a while, the hornets didn’t confine themselves to the stairhall – they discovered our balcony! Although we never actually saw one outside, they did seem terribly excited about our well-lit balcony door. Whenever we opened the door in the evening in order to water the plants, it only took a second until a hornet entered our living room. It would then fly confusedly and slightly aggressive around the flat until Karsten would catch it and release it outside again. On the second evening, one hornet almost caused a small fire when it got burned in our floor lamp – let me tell you that hornets, due to their size, cause a lot of fume, and the smell sticked with us for the next hours. On the third evening, Karsten joked that we should bet whether or not another hornet will enter our flat once he starts watering the plants. I laughed at him, saying that it would be such an incredible coincidence if it happens again. Said it, opened the door and stared at the hornet that entered immediately as if it had just waited for us. This hornet suddenly disappeared in our living room and I found it after a while hidden behind our sofa cushion (not the nicest prospect to sit on a hornet, isn’t it?). 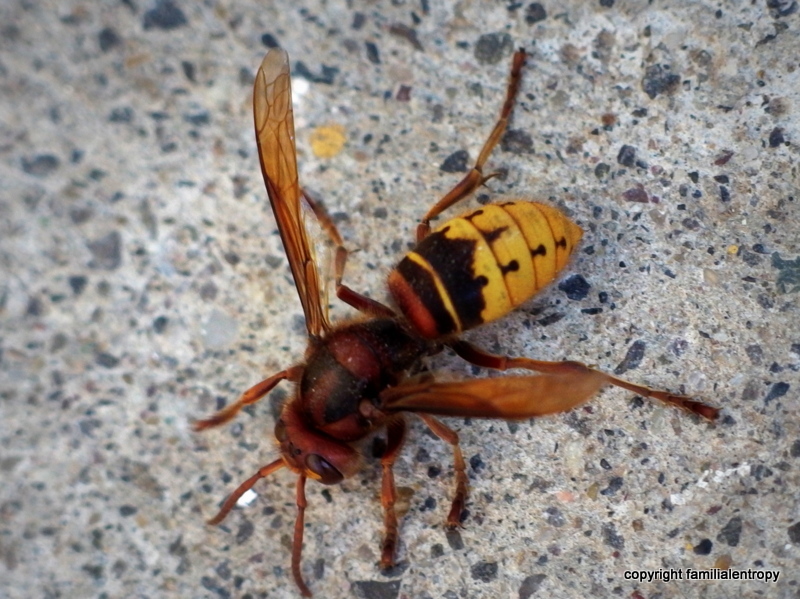 Last weekend, a hornet that we believe to be the queen was lying right in front of our door, half dead and therefore slightly pissed off, if I may say so, with its sting pointing right at us. I will memorize it as a perfect hands-on (or rather hands-off!!) outdoor survival lesson for the little one right in front of our nose…. Yesterday, I took the laundry rack inside our living room. I heard a buzzing sound and thought “Oh my, I am getting paranoid!”. Two hours later, Karsten wanted to fold the laundry and I heard him say “Oh dear, I think I am getting paranoid. For one second I thought there’s a hornet hidden in the laundry!”. That pricked up my ears. And indeed, in the middle of burp cloths and towels, there was yet another hornet hidden. Well, it’s getting cooler outside. We should see less of them within the next weeks. And while I very much appreciate having endangered species around our buildings, I think I will breathe a sigh of relief if I don’t have to fear hornets in the hobbit’s blankies…. This entry was posted in Miscellaneous and tagged Children, endangered species, hornets, Hornissen, insects, summer. Bookmark the permalink.